Braising is a cooking technique that CookingShorts has traditionally avoided. As we like to keep our recipes simple and easy, we didn’t think that a braised recipe would fit with our mission. Recently, I’ve been experimenting more and more with beef and pork products. I was looking for a few different cooking methods rather than just throwing a piece of meat on the grill. I kept getting tons of suggestions from other foodie friends about trying a braise and several members in our foodie group recommended a beer braise. After a cookout at our house, we had some leftover beer and thought we’d give it a shot. Boy, we have been missing out and leaving our fans in the dark. Not only was the beef amazingly flavorful, but the technique was so easy. Braising is really just a fancy word for “slow cooked”. If you can use a crock pot, then you can braise. 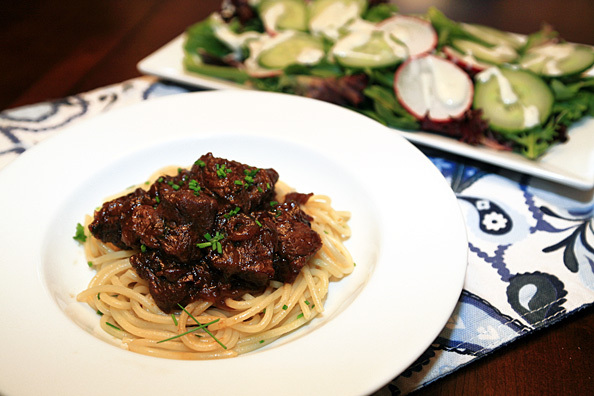 Braising beef breaks down meat and makes it super moist and tender. The flavors concentrate, making an “out of this world” sauce. I love Blue Moon beer, so that is what I used in the recipe. I love the light citrus notes it gives the sauce, with a wheat undertone. If you love Blue Moon beer, then you will rock out with this recipe. Enjoy! Thanks fellow foodie friends for your suggestion. Heat about 1 tbsp. of olive oil in a large Dutch oven over medium heat. Add the onions and season with salt, pepper, and thyme. Slowly cook onions until they are deep in color and caramelized. This will take about 30 minutes, stir them about every 10 minutes. Remove the onions to a plate. Add an additional drizzle of olive oil. Raise the heat to medium high. Season the beef with salt and pepper. Sear the cubes (in small batches) until browned on both sides. Preheat the oven to 325. De-glazing the pan with the Blue Moon, be sure to scrape the bits from the bottom up with a wooden spoon. Add the first batch of meat back to the pan along with the caramelized onions. Add the remainder of the Blue Moon, filling the pan to almost completely cover the beef. Cover the pot and put it in the oven to braise until the beef is tender, about 2 hours. Serve over white rice or noodles to soak up the juice from the stew. Enjoy.